3. 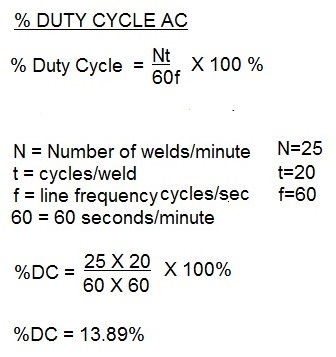 Divide the weld current by the turns ratio of the weld transformer. This is the Primary Demand Current. 4. Multiply the Primary Demand Current by the square root of the duty cycle. This is the Primary Effective Continuous Thermal Current (ECTC). 5. Refer to the Ampacity Chart of the cable type to be used. Select the size based on the Primary Effective Continuous Thermal Current (ECTC). 1. Divide the transformer nameplate KVA by the primary voltage. 3. The result is the Primary Effective Continuous Thermal Current (ECTC). 4. Refer to the Ampacity Chart of the cable type to be used. Select the size based on the Primary Effective Continuous Thermal Current (ECTC). Ampacity charts are based on the National Electric Code (NEC). There may be other state, local or company standards that must be followed. 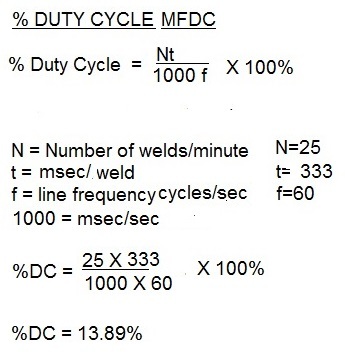 MFDC stands for MID FREQUENCY DIRECT CURRENT. There are two components needed to convert standard alternating current (AC) to MFDC. They are the weld control and the transformer. The weld control is made up of two major areas, the first being the Bridge Rectifier where the three phase 60 Hz AC input is rectified into a DC output. The second section is the inverter, or H=Bridge, which is a polarity reversing switch. This switch also operates at the desired increased frequency of 1000 Hz. In the H-Bridge the rectified DC input is converted back into a single phase AC square wave output at 1000 Hz frequency, as shown below. This mid frequency AC is the input to the primary of the transformer. The diodes in the transformer then converts this AC back to DC (MFDC) for welding in the secondary circuit. What is a cascade control? In many facilities it is beneficial to insure that the multiple welders in a station not fire at the same time to prevent a sudden large draw on the plant power supply. To spread this out cascade controls can be employed where one control will sequence through several contactors in sequence. The sequence and separation between the welds can be controlled to give an appropriate modest draw on the power supply.